Stem cells are all the rage in the aesthetic industry and while many physicians provide fat transfers, very few actually have the technology to purify the fat, isolating stem and regenerative cells. One of these physicians, who practices in the U.S. as well as Europe, Dr. Renato Calabria uses the PureGraft in his practice in Beverly Hills, CA. In his practice in Italy, Dr. Calabria uses EU-approved technology that may soon be making an appearance in the US. This new technology "turbo-charges" stem and regenerative cells in fat, which Dr. Calabria then transfers to the patients face for his Stem Cell Facelift. In lieu of a traditional facelift, the Stem Cell Facelift uses the patients own fat as a facial filler. "Fat grafting has been around for 20 years. It is a procedure that is well-proven to be effective but there's nothing new in it," Dr. Calabria continues, "Procedures performed in the U.S. are for the most part still fat grafting. The new and truer technology available has nothing to do with mere fat grafting, but isolates the more pure stem and regenerative cells. In Europe, it's already been approved by the Europe Union's equivalent of the FDA; in America, the new technology is awaiting FDA approval." In the U.S., Dr. Calabria uses the PureGraft by Cytori to purify fat that has been removed from the patient through liposuction. "PureGraft is available now with FDA approval in the US., and it's a big step forward over other fat-grafting technology available currently in the U.S. because it purifies the fat in a very scientific way. It's not just a small centrifuge that washes out the fat, like we all used in the past. It's a system that is very well-engineered and sterile. It gives you a really clean result. It does 'pure fat graft' and eliminates the anesthetic, blood and all that unwanted material." However, in Europe, Dr. Calabria has access to more advanced technology that he says greatly improves his Stem Cell Facelift results. One of the first in the world to perform the Stem Cell Facelift, Dr. Calabria says his patients experience not only volumizing of the face, they also get improved texture of the skin. 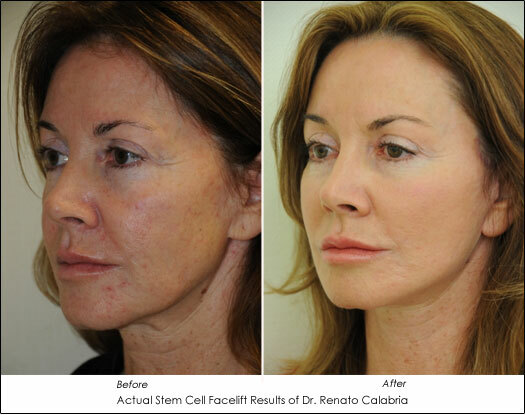 For the past two years, Dr. Calabria has been performing his cell-enhanced Stem Cell Facelift and has been very pleased with the results. Main concerns of a fat transfer is whether the fat will survive and the longevity of the results. Dr. Calabria says of his cell-enhanced procedure, "We know that cells that have been 'turbo-charged' with these concentrated cells have a much longer longevity, last far longer than normal fat grafting. And we know one of the drawbacks of mere fat grafting is that the effect can completely disappear over a short time. So with a more refined stem cell procedure, the prolonged effect of it is really quite revolutionary."